Do you have a flat commercial roof that needs work? Repairing or replacing a flat commercial roof is a job that needs to be handled only by a professional roofer as these tasks require specific skills and tools. Consider that even the slightest mistakes during roof installation or repair can cause severe issues. What’s more, working on a roof is exceptionally hazardous and can even be fatal. While a roofing contractor uses many tools when working on a flat roof, there are some common roofing tools that are more critical than others. 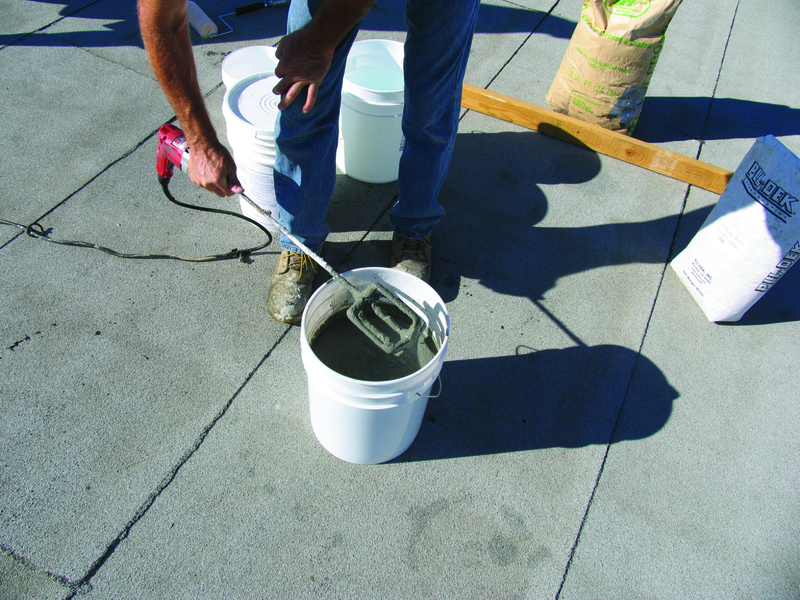 Here are some of the most basic tools used by a roofing contractor on a flat commercial roof. A good roofing hammer is a must for any commercial roofing contractor. Roofers use roofing hammers for removing misplaced tiles, tapping down nails and cleaning their work areas. These hand tools come in various shapes as some look like a hatchet, while others resemble a standard hammer although there’s a missing claw. When only a few shingles need replacing, a hammer is sufficient. But when a roofing contractor has to replace an entire roof, a power nailer is needed for speeding up the installation process. In fact, a roofing nailer is the main tool used by a commercial roofer. The best type of nail gun for roofing is known as a coil nailer, which comes in various sizes for accommodating different nail lengths. These tools are available in both battery and pneumatic styles. Shingle removers come in several versions. One specific kind looks like a shovel containing teeth although there are other types used for various applications. Some versions are intended to be used for tearing off shingles. Others, which include wheels and a cart, are designed removing existing roofing into a roll. A roofing contractor uses a utility knife to cut roofing material, such as shingles, so they’re the proper size and shape. A utility knife that’s specialized for roofing contains a knob for opening and closing it so that there’s no need for a screwdriver. The blade, which is secured by a magnet, is hooked, making it easier to cut shingles and felt. Once a roof is repaired or replaced, a commercial roofer uses certain equipment to ensure that the job looks presentable and neat. A few of the basic roof cleaning tools include those, such as a stiff-bristled hand broom and a power broom. These tools are used for sweeping away loose debris and gravel off a flat commercial roof. Other essential cleanup tools are a shovel, garden hose with nozzle, vacuum, high pressure washer, backpack blower and air compressor. A roofer also uses a dumpster to remove a large amount of materials from a roof. Moisture detection equipment is used to determine the dryness and soundness of a roofing surface and its underlying insulation. 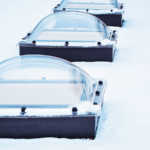 In other words, these meters are needed for measuring the amount of moisture content in roofing materials. • A flat head shovel is used for removing exiting roof shingles. • Caulking guns are used for dispensing caulk from a tube. • A roof hoist is a tool used to raise and lower supplies and equipment from a roof deck. • A chalk line, which is a marking device that makes drawing a long straight line easy, is used for placing shingles so that they look symmetrical. • Hammer tackers are staplers that are used for nailing down tiles. These tools contain the same basic machine components that are found in a regular hand-staple gun and are easy to use. 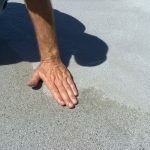 One of the main problems of flat commercial roofs is ponding water, which is rainwater that remains on a roof for 48 hours or longer, following rainfall. 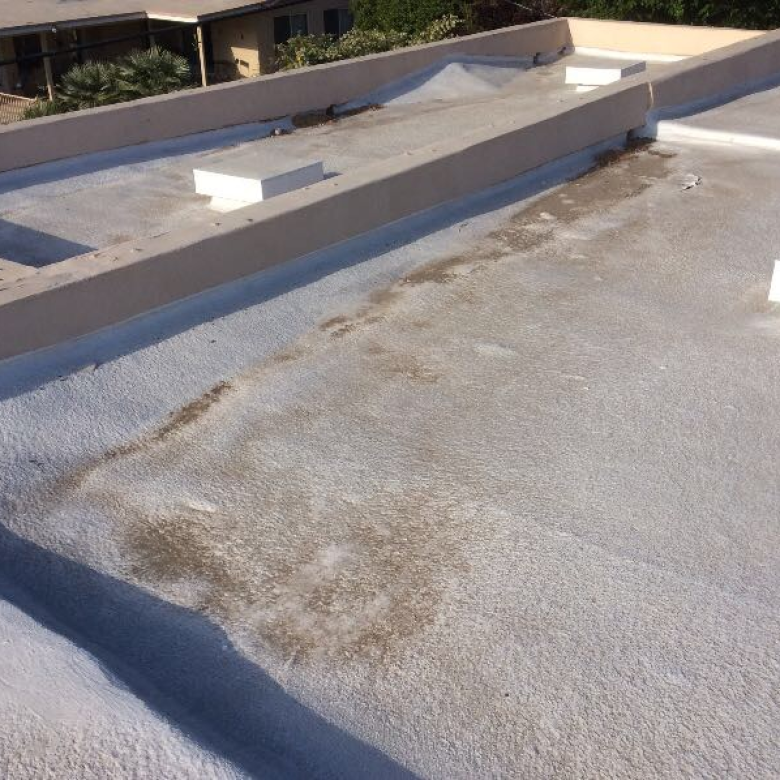 Fortunately, we have an exceptional product formulated to fill in low spots on flat commercial roofs. 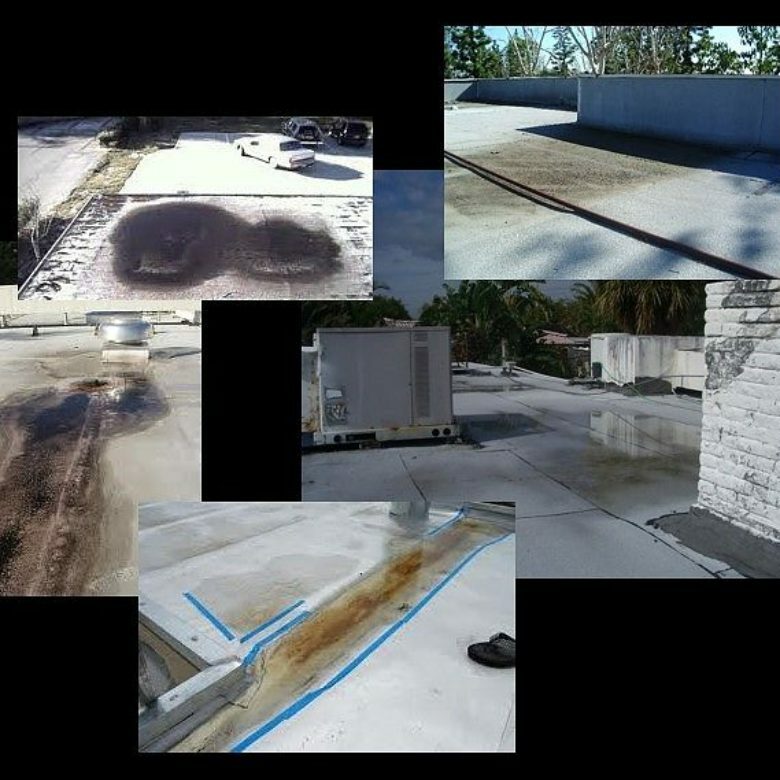 Please contact us and learn more about how you can prevent ponding water from damaging your flat commercial roof and building.